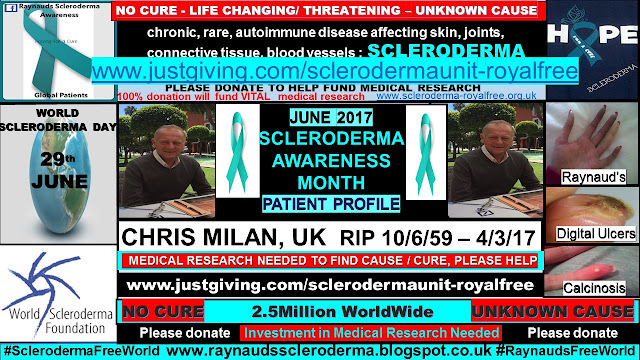 Chris Milan from Reigate in Surrey, UK was diagnosed with diffuse systemic scleroderma, Antibodyscl70, in 2014, aged 55. Dr Jawed, Consultant Rheumatologist at the New Victoria Hospital, local hospital diagnosed him. This was the third medical opinion sought for a diagnosis. Symptoms had been ongoing for about 10 months prior to final diagnosis. General feeling of unwell, exhaustion, jaundice, compromised liver (shown on blood tests) and stiff joints. He had always suffered cold hands and feet but not too extreme. Chris was a very fit and active person. 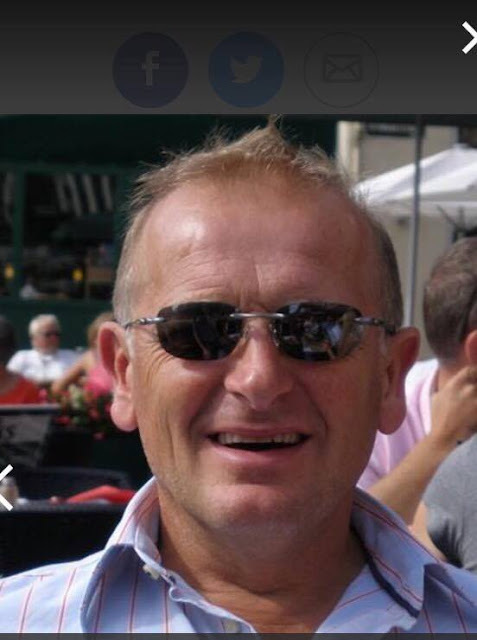 He ran the London Marathon twice sub 3.40, took part in triathlons, successfully developed and drove his business forward, cycled Lands End to John O'Groats, Reigate to South of France, and one end of Sardinia to the other (mountainous and steep climbs). All this, mostly, cycling 100 plus miles a day. He became ill within a week of returning home from Sardinia - in his own words - "the hardest physical thing he had ever done". Our opinion was that this was the trigger for the onset of scleroderma. The speed with which things progressed was frightening - there was very little response to the cocktail of drugs although they slowed it a little. The chemotherapy made no difference. His main symptoms were joint pain and stiffness, initially in his hands, but very soon, this progressed to elbows and upper arms and then his whole body. This, coupled with digital ulcers that engulfed his arms and progressed to his legs. 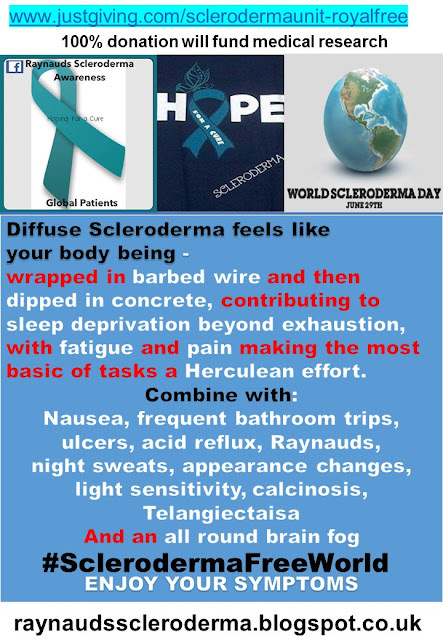 When he first went to the Scleroderma Unit his skin score was 27/51, in July 2015. By the time he had the transplant in February 2017 it was 51/51 – a very aggressive progression. 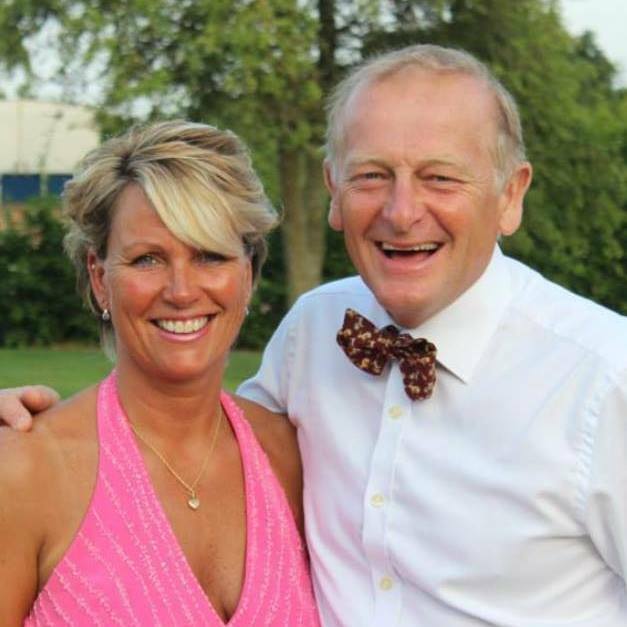 He was 57 when he died whilst undergoing a Stem Cell Transplant. Today, June 10th is Chris’ birthday, please hold his wife Jane, and their family, in your thoughts and prayers on this day. Thank You. 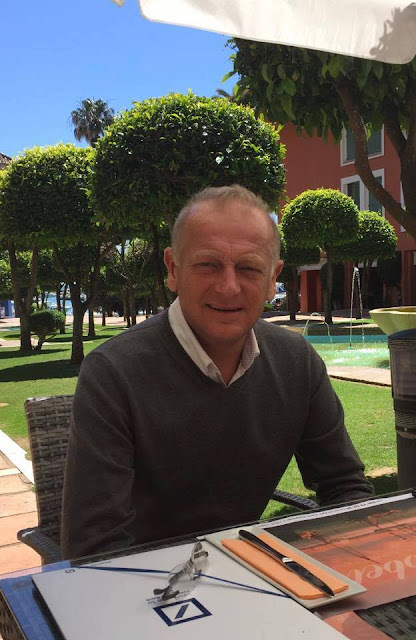 Huge thanks to Jane, for sharing Chris’ very brave scleroderma experience, where sadly, his disease did not respond to any of the current treatment, not cure, options available. Please donate to the Just Giving Page in memory of Chris, where 100% of your donation will be used to fund medical research at the Scleroderma Unit, Royal Free hospital. To know more about Chris, Click here, to see the Raynauds Scleroderma Awareness Global Patients Facebook Gallery. 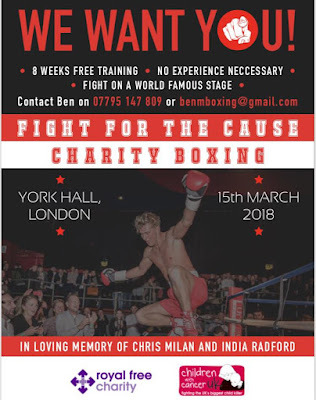 Huge Thanks to Ben for his fundraising efforts in memory of his Dad, Chris.